It’s March, and if you’re a college basketball fan, you know what that means. 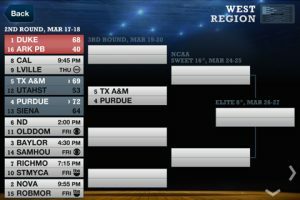 To help you keep on top of the madness, the NCAA have just launched a new universal app for iPhone and iPad – NCAA March Madness on Demand. A free download, NCAA March Madness on Demand will help keep you in the know, with live streaming of every 2011 Division 1 Men’s Basketball Tournament right to your mobile. From the First Round to the Championship Game, the NCAA March Madness on Demand app gives you access to the Bracket Challenge, in-game highlights, live scores and leaderboards. New social integration features mean that you can comment on the games in real-time via Facebook and Twitter, as well as receive alerts on your favorite teams throughout the season.